Professional Charter Services offers simple and convenient last mile transportation solutions to improve the accessibility of your campus. Our last mile shuttle programs offer a safe and reliable method of transport between your campus or workplace and public transit stations for your employees. How do your employees get from the last public transportation stop to work? Is your workplace or office far from the nearest train or bus stop? Do your workers have to fend for themselves to get to work once they get to their stop? When your employees don’t have a comfortable way to get from their last bus, train, or ferry stop to your office, they have to either walk or bike that distance, leaving them to arrive at your office hot, dusty, and tired. That’s not the ideal way you want your employees to begin their day. Get happier employees, watch productivity soar, boost morale, and retain people longer when you delight them with a convenient, wifi-equipped shuttle that will pick them up at their last stop. Professional Charter Services will meet your workers at the right place at the right time and drive them straight to your office. Your employees will travel safely, comfortably, and in style when they board one of our comfortable shuttle buses, and they’ll arrive rested and refreshed rather than harried and stressed. With a large part of the San Francisco population choosing not to drive due to heavy traffic and parking frustrations, Last Mile Shuttle Services offers a reliable way to get people from one destination to another. Many corporations are figuring out that the smoother they make it for employees to transition between the last public transportation exit and the front door of their company, the more productive and positive employees will be during the workday. If you have employees that are required to travel that “last mile” between the nearest public transportation stop and your office building, consider some of the reasons to begin implementing last mile shuttles. Employees arriving at work on time is essential for productivity. Although it is true that the main responsibility of arriving to work on time is in the hands of each individual employee, the best businesses and companies are proactively looking for ways to streamline this process and make it as easy as possible. Last mile shuttle services reduce frustration and tension for both parties by making scheduled stops at each of the nearest public transit stops to pick up the employees that have gathered there. They board the bus and travel in comfort the rest of the way to work. Compared to walking, last mile shuttle services make it easier and faster for employees to get to work. Nothing is worse for employees than getting off at their last stop and having to walk the “last mile” to the office when the weather is anything but optimal. Whether it’s too hot, rainy, or other unpleasant conditions are present, every employee will dread making the trek. However, with last mile services, employees can get off at their stop, immediately board the shuttle, and head to the office rested and refreshed instead of flustered and annoyed. You want your employees to arrive to work on time, and by cultivating punctuality, you are doing the same with professionalism in the workplace. This offers more than just transporting employees to and from work; it also promotes the positive traits in your employees that will make them better all-around workers. Implementing a last mile transportation solution will encourage punctuality. Your employees will see that you’re doing your utmost to make it easy for them to be punctual, and you’ll likely notice a difference because of it. 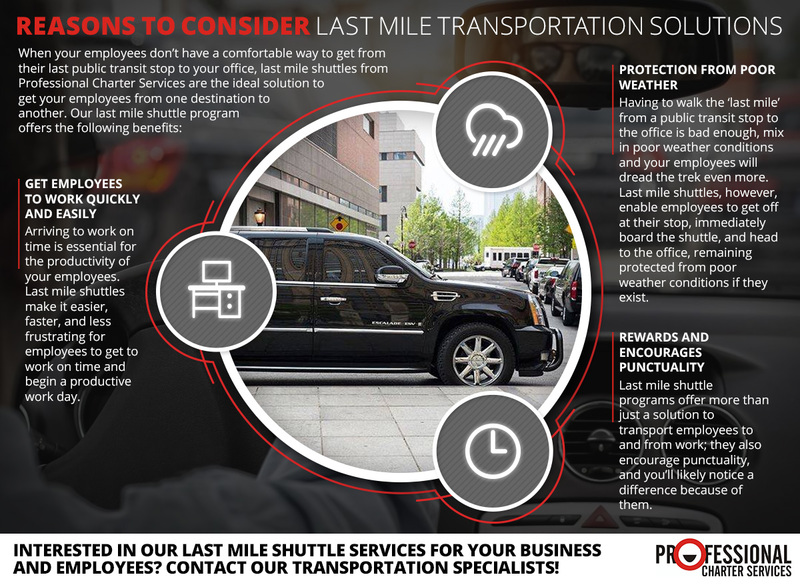 For reliable, on-time, courteous service that keeps your employees more productive, schedule your last mile transportation service with Professional Charter Services today. To get started, you’ll want to speak with one of our friendly transportation experts to put together a plan that works for you, your employees, and your budget. Give us a call today and ask for a quote for Last Mile Shuttle Service. We look forward to serving you.